Ah, Spring! The magpies were a-swooping, the cane toads were a-hopping and, halfway through the first sweaty cut of the season, my mower had a-stopped. “Take it to the mower shop!” they yelled. “That’s the problem with you lot,” I scoffed, “you give up too easily!” I returned to the shed while Long Suffering Wife phoned our neighbours to apologise. Now, I had fuel, air and enough spark to start Frankenstein’s heart. Plus, if the smoking hole through my toolbox was any indication, I certainly had plenty of compression. Also, after countless yanks of the starter chord, my right arm was four inches longer than my left and my shoulder muscles had turned to custard. Defeated, I gazed forlornly at the pastures surrounding Bray Manor and it slowly dawned on me how much time, fuel, fertiliser, poison and water I pumped into our turf each year. This wasn’t a lawn; it was a high maintenance money pit! Inspired, I calculated how much concrete I’d need to cover our entire yard, then did a rough estimate of the cost. I was over the worst of the shock by the time I got to the mower shop. The mechanic is probably still chuckling at the look on my face when my mower roared to life. 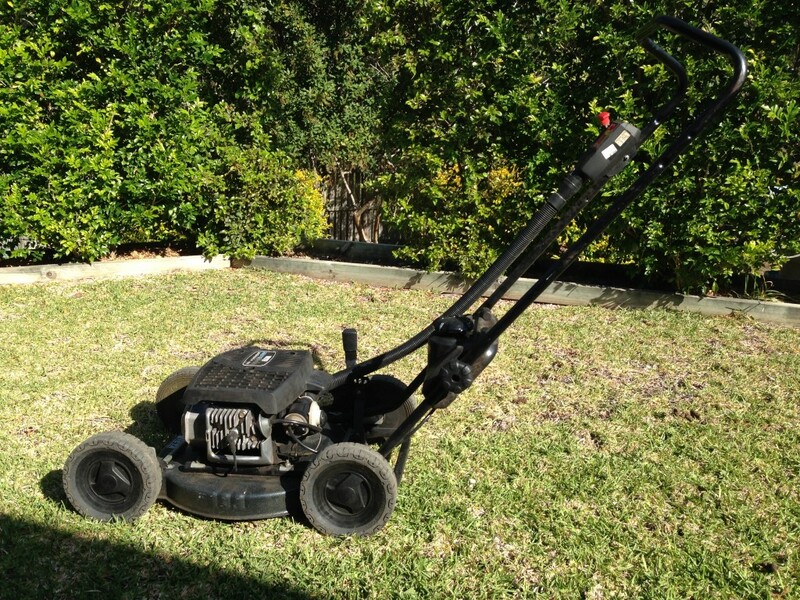 I raced it back home, wheeled it into the shed and carefully placed a sledgehammer, grinder and a brochure for a battery powered mower in front of it; I expect the rest of the mowing season will be trouble free. And if it isn’t, then I’m definitely going to re-consider the concrete option. Of course, I’d paint it green to make it look natural. This entry was posted in On a Lighter Note.... Bookmark the permalink.